The Sea Salt Superstore and Caravel Gourmet, was founded with the simple mission to bring old world flavors including exotic spices and hand crafted artisanal natural sea salts to gourmet food consumers. Our Caravel Gourmet product line offers one of the largest and highest quality collections of gourmet sea salts in the world. In addition to the wonderful natural salts we source from different parts of the world, we are also experts at creating natural salt infusions and blends that add dynamic flavor and aroma to any dish. In addition, we are one of the leading US importers of Himalayan salt products that are extremely popular because they are unique, beautiful, and fun to use while cooking your favorite foods like meats, seafood and vegetables. Linnea Brands is a leader in the fast-growing industry of sourcing and distributing fine, handcrafted Himalayan salt products. Their mission is to supply retailer customers with the highest grade Himalayan salt products available. Linnea offers products in 3 general categories. These include edible salt products such as salt shakers, small & large grinders, 1.5 lb. bulk refill bags, and single serve packets. 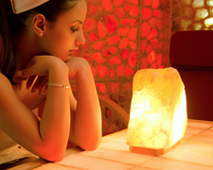 They also have a variety of Salt Lamps & Salt Candleholders. Finally, their Salt Cookware includes cooking tiles, salt bowls, glasses, and mortar & pestle sets. And Linnea's pricing is very competitive, too! As consumers become more aware of the benefits and beauty of Himalayan salt products, Linnea continues to provide unique, custom pieces that are packaged to be both visually appealing and more marketable because of their highly descriptive labels.